"My name is Obinna. When i arrived Dubai and couldn't get a job, i decided to think out of the box on what to do to make a living and one day, while in a local restaurant, a man came and placed an order. When the waiter came with the order, it was Chicken With Mashed Potato and Grilled Corn but the corn was not roasted the native Nigerian way as we do with coals. "That was when the idea came and i decided to give it a try. I contacted a local farmer who supplied raw corn for me and started roasting them close to my neighborhood across the street. "At first, people who passed by looked at me with curiosity as they had never seen anything of its kind up until one man approached me and i gave him one corn cob to taste. he liked it and the following day, invited 4 of his friends who bought and even took some home." According to Obinna, that day marked the beginning of his turnaround in the business. 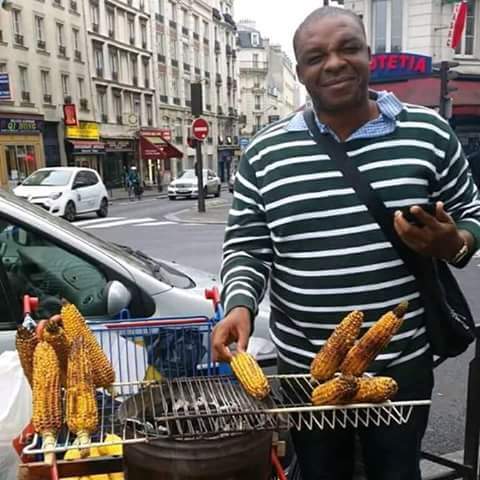 The business according to him is the first of it's kind in Dubai and in no time became a popular delicacy in the neighborhood with people especially Nigerians living there who want to have a taste of home patronise him on a daily basis. When asked how much he makes as profit, Obinna smiled and said, "The profits are not bad. I sell each corn cob for about 5 to 8 Dirham depending on the size and on a very good day, i take about 60 to 80 Dirham (22$USD)(N8,000) home. ", he said.